"When I'm painting it's like creating an image of the attributes of God, creating the same vibration that created you, like a loop that feeds back to you in a circle of life, with the same resonance." A brown-skinned mother wrapped in a soft, red robe cradles the snowy Taos peaks in her lap, smiling down at them like her earth child. The flow of here robes are the mountainsides. "Madre Generosa," the generous mother, is the guiding principle in the most recent work of Charles Collins, whose shining creations transcend painting with an invitation to change our collective consciousness. His show, "Triumph of the Spirit," opened Saturday (April 4) and ran through April 26, 1998 at the Van Vechten-Lineberry Taos Art Museum, 501 Paseo del Pueblo Norte. "This is a wonderful show, one of Charles' best," said museum co-founder Novella Lineberry. Collins, who is best known for his encouragement of other artists through God in the Arts Foundation, said God in the Arts evolved out of a desire to encourage anyone who "believes that all life is like petals on the same flower." Collins has been working on this series of 22 paintings for about three years, he said. Some of them are still lifes and "wind warriors," but 10 of them are influenced by the book, "Essenes," painted in the style of the old masters. The Essenes were members of an ancient Jewish sect of ascetics and mystics who understood that all life is interconnected, that there is no time, Collins said. "We're all one and the same thing. We just don't know it," he said. "The Essenes are the teachings of Christ about the earthly mother and heavenly father, and the oneness of all life everywhere, the never-ending circle." Most of his oil paintings are profoundly spiritual and evokes strong sense of peace and timelessness. He begins with a charcoal drawing, adds a thin glaze with a dark color, terra green or burnt umber, which provides the base for light to reflect off. This is covered by an under painting -- when his inages in the over painting are complete, he adds up to 30 glazes. "You can't hurry it," he said. "The light bounces off the undertones, illuminating every layer as it bounces back to the eye," he explained. "Color has become light." He has learned most of this on his own, by experimentation, he said, though he has a degree in fine art from the Dallas Art Institute in Texas. "My work is in collections all over the world," he said. He is the first Taos artist to have painted an album cover for singer Michael Martin Murphey and another for the international recording artist, Arlo Guthrie. His paingint, "The Ambassadors Meet in Washington," part of the Van Vechten show, was the first in the 23-year history of Taos Invites Fall Arts Festival to win both Best in Contemporary and Best of Show, Collins said. Of course, he was thrilled to be invited to show at the Van Vechten-Lineberry Museum. "I want to thank Ed and Novella Lineberry for giving me this wonderful opportunity to share my vision, and their vision too." "The Ambassadors Meet in Washington" is, like many of his paintings, an inter-dimensional creation with multiple layers of reality that gradually reveal themselves to the persistent eye. 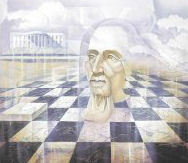 A chessboard of black and white marble, some of the squares floating in air, forms the floor, symbolizing "moves of diplomacy," which are always in a state of flux, he explained. The board is fretted with veins of entergy that outline the continents of North and South America. To the left, on a smooth green hill, stands the pillared White House, in an idealized state of balance, order and truth. In the center is the head of America's first president, George Washington. His balding dome forms a central arch. The three standing figures emerge from his face to create the archetype of our democracy, "Each one of us is an ambassador," the artist explained. In Washington's eyes are the brown faces of two of the ambassadors. The third, shown from the back as a woman wrapped in a cloak, is the president's nose and mouth. "They are discussing what needs to be done," Collins said. 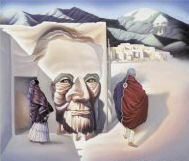 A number of his best paintings feature American Indians in the dramatic setting of Taos Pueblo, against the backdrop of Taos Mountain. 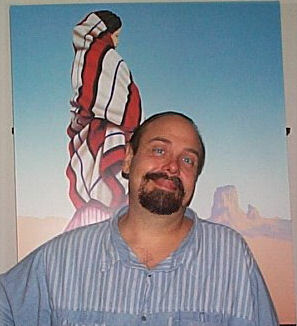 Collins said in the 23 years he has lieved in Taos, he has come to feel spiritually close to the Pueblo. "All cultures have the same basis," he said. "Taos Mountain always felt like she was encircling me with God." "Madre Generosa" is the protector and giver of life and love, who raises and feeds us, Collins said. "The Buddha said the weight of continents, the weight of the oceans and even the highest mountains is not a burden at all compared to the burden of not paying back the kindness of life." How can we do that? "By being kind to each other," this bearded mountain of an artist said with a smile. Although he admits that nature is often harsh, "we have created civilizations to help each other through the vicissitudes of nature. It is our highest nature to help each other. There is no death -- not really. Sometimes pain is the only way we learn." A painting titled "Eternal Companions" weaves together the elements of earth, air, clouds, sun and water, the artist said. 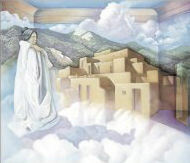 A robed figure stands looking at the golden walls of the Pueblo, which appear taller, almost modern, full of light. Faintly visible in the pine-covered mountainside are the words "LOVE" and "GARDEN." The room of the universe in which these elements mingle is defined by the molding of the ceiling; the door through which we all pass represents the illusion of space-time. "Lots of imagery from the Essenes filters through our minds and spirits," Collins said. "Angels of water, angels of sun, angels of life and joy are creative principles as well as actual beings on a physical plane. Their combined energy creates life and the vibrations that sustain us down to the atomic level. When I'm painting them, it's like creating an image of the attributes of God, creating the same vibration that created you, like a loop that feeds back to you in a circle of life, with the same resonance." He spoke of a passage from Essenes that had impressed him: Christ talks about taking a vessel made of earth, filling it with the angel of earht and seed, adding the angel of water and sun, so the angel of life comes to grow wheat grass. He said when you are out of balance with God, nestle your bare feet in the grass and it will bring you back into harmony. He said "I'm sure that's where the concept of communion came from -- harmony and perfect simplicity." In "Abraham Goes to the Mountain," a door way opens into other dimensions in time. "The Pueblo, to me has always felt like a temple. It's a place of origins, of mystery, open but hidden, a place of paradoxes," he said. "The mystery goes beyond any reality that we're familiar with; it exists, but it's not seen." The figure of an Indian elder he identifies as "Sunhawk" is leading the viewer to the mountain where you see the face of George Washington. In "Voices of Silence," the shadow of the santo is cast over a painting of the mountains. "This shows how people's concepts can cast a shadow over a whole group," he explained. "This is about people who are oppressed by those who can't understand them." "Beginning of Wisdom" celebrates male and female archetypes on pedestals. The male, who carries the vessel of civilization, is firmly grounded, while the female levitates like an angel of joy. 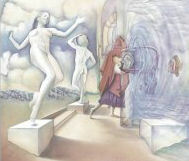 A cloaked woman carrying a pot passes through the doorway in an initiation from one time to another, Collins explained. On the other side of the door, the ocean fluctuates in sunlit waves while angel fish return through these waves to a state of oneness. "Emperor of the Soul" portrays a robed figure being carried over the rocks and travails of life by cloth-like waves. "When you're centered in love, nothing can hurt you," Collins said. He spoke of a teacher "not in a physical body," who, when asked for pure, undying love and light, replied, "How can I give you what you already have?" In "Ocean of Consciousness" a smiling Mother Earth rises from her perfect reflection in the ocean, lifting global consciousness over her head in the form of the planet. To her right the moon appears like one of the earth's children, over-mined, dewatered and desolate. "It could happen to the mother too," Collins said. Signed commemorative exhibition prints are available for purchase.